In the house of the Sun - You can enjoy the salt water pool, the games room with snooker and table football, the tennis court and sports field. You can stroll through the gardens or take walks through the surrounding hills. You can visit the beaches of Apúlia, Fão, Esposende and Viana do Castelo. The House of the Sun - is inserted in a small farm, with about 10 thousand m2, all fenced and with excellent sun exposure. The gardens have about 4 thousand m2 of green spaces. The house is fully furnished and equipped. There is Wi-fi internet. Outside the house there is a barbecue, a tree hut, swings and hammocks. The house has linen and a set of towels per person. 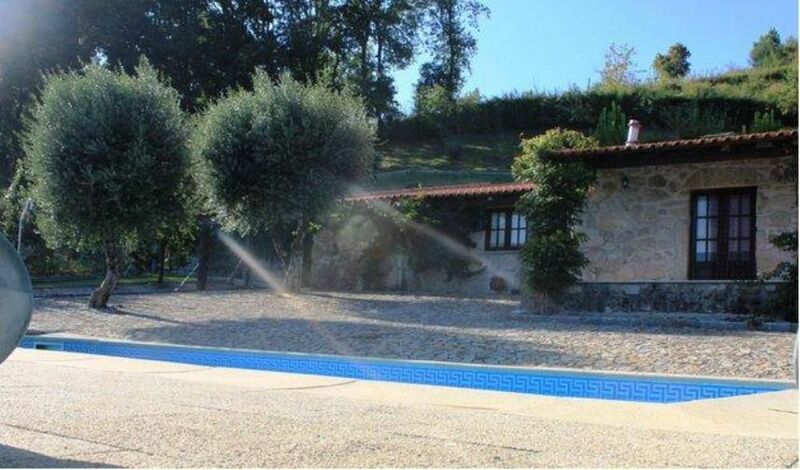 This house is located in a central point of the North of Portugal. The house is ideally located to visit the places of tourist interest and the great cities of Northern Portugal. In the farm of Linhares - Rural Tourism, you can choose to stay inside the small farm and enjoy the Saltwater Pool with removable cover, which allows to obtain good temperatures in the water from March to October. You can also use the games room with snooker and table football, tennis court and sports field, stroll through the gardens or take walks through the surrounding mountains. You can also visit the beaches of Apúlia, Fão, Esposende and Viana do Castelo. The farm of Linhares - Rural Tourism is inserted in a small farm, with about 10 thousand m2, all fenced and with excellent sun exposure. Inside the property there are 3 houses. The exterior spaces are common to the 3 houses. The farm of Linhares - Rural Tourism, aims to make a difference for their clients by providing a quality service: personalized, warm and welcoming. In a very comfortable house, surrounded by a sealed space very pleasant and relaxing an environment rural where tranquility and silence offer true moments of rest and quiet, with green space, pond, orchard and vineyard, where you can enjoy all the beauty congenital rural paradise with a view of Mount Borralho, where wild horses live. Adjacent to the Peneda-Geres, considered by UNESCO as a World Biosphere Reserve, is one of the greatest natural attractions of Portugal. Very nice place in a great spot. Owners very hospitable and the facilities all ok. Everything clean enough all in all in all a great stay even though we had some very noisy neighbours for a couple of nights! "This house exceeded all our expectations. The location is peaceful and quiet. It is a magnificent setting with stunning views. House absolutely spotless. Inside and outside the house is clean and tidy. With a great swimming pool and sports field where we spent most of the holiday. The owners greeted us and showed us the way to the property. When we arrived they showed us throught their lovely well-equipped house. The owners have thought of everything that your customers may need.. We throughly enjoyed our stay and recomend this rental highly!!" The house of the Linhares is inserted in a very calm and relaxing place, near the Gerês area, in a country atmosphere, where the silence offers true moments of rest and quiet. You can also enjoy the beauty of the surrounding countryside and enjoy a paradisiacal view of Monte Borralho with wild horses. The house is ideally located to visit the places of tourist interest and the great cities of Northern Portugal: Braga, Gerês, Porto, Guimarães, Viana do Castelo and Ponte de Lima. It has great accesses, always on a motorway, the last 3 kms are on national road.